It is a rare occurrence that any designer or brand has two books published, both of which are singularly devoted to their oeuvre, let alone a Generation X designer whose name is hardly one that falls off the tongue of every fashionphile. 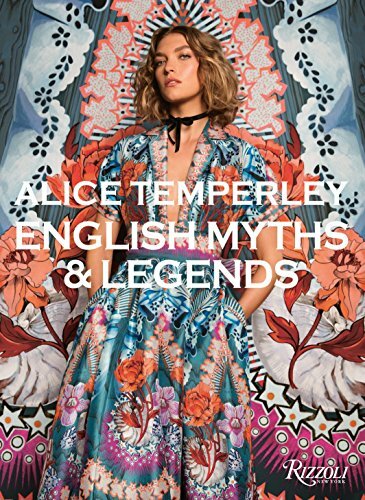 In a case of never say never, Alice Temperley: English Myths and Legends is the second book within six years to be solely focused on the work of Alice Temperley. What will now be written and espoused here is a collection of observations and thoughts rather than a distinct and clear cut review. It will be up to the perspective reader to decide if this is what they need or want to know about a designer who has been in business for less than two decades. Temperley, who has supposedly authored this book, refers to herself by her first name, which seems rather odd on its face. Is she a narcissist or just simply affected? Visually, the book is quite beautiful and apparently is made up of mood boards, sketches, and stills from various collections of the last six years. Some images are details of prints, embroideries, beadwork, or detailing such as closures and finishing. The more seasoned and informed fashion aficionado will know that since the publication of the last book, Temperley has taken a 180 degree design turn from where she started in terms of overall look and appeal. Of course this is not spoken of nor is the fact that part of Temperely’s initial notoriety stemmed from her clothes being worn by the Duchess of Cambridge. What one might also be notice is that the clothes seem to bear a distinct kinship to another British designer, Mary Katrantzou. In the end you just might question the exact purpose of this book other than some sort of self-justification or self-congratulatory love letter about one’s professional talents. In the business of fashion so much of what is glorified, intellectualized, and romanticized in Alice Temperley: English Myths and Legends is common currency among many if not all other designers. What your reaction might be to the book is up for grabs as mine was not so much negative as perplexed as to why and what has been presented here as being worthy of a book. It can be said that there is really no real news here other than this individual designer’s approach to how and what she designs.